I heard of a new corporate term today. It’s the CBO of a leading chain of shopping malls in India. I have heard of a CEO but had not heard of a CBO. A guy has been employed as the Chief Belief Officer – he is in charge of the “culture” of the company. The beliefs of the staff are his domain. 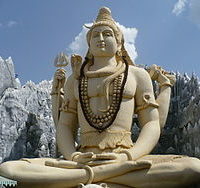 This same guy became famous for writing a series of bestsellers based on a construction of a story of the life of the mythological figure Shiva.